Much of the confusion and uncertainty surrounding Rippln can be attributed to the manner in which the creators have marketed the scheme. A silly affiliate NDA, lack of information on the corporate structure and ownership of Rippln, a compensation plan and business model that appears to have not been finalised, nothing concrete on the app the company is supposedly based around… and the list goes on. Despite the company’s best efforts to thwart those interested from conducting thorough due diligence into the company, a purported 200,000+ people have handed over their personal information and signed on. At the time of publication, any and all efforts to acquire specific details on the MLM side of Rippln have been met with a tin-can “we are currently in buzz marketing mode now and not accepting payment from affiliates, so we’re not currently disclosing anything further” type response. Despite these efforts however, today we take you behind the Rippln veil and share what has thus far been uncovered. Hi Everyone- I thought I would jump on really quick and put the minds to rest of those that hasveseen (sic) the negative press about Rippln CEO, Brian Underwood. I have worked with Brian Underwood over the last six years, and have known him to be both honest and forthright. The allegations of Brian Underwood being sued or investigated by the SEC or in another lawsuit are false. Anyone wanting to verify this themselves can always search the public records of Edgar Online. Mr. Underwood has been in the industry for many years as a distributor and more recently as a corporate officer. As a Corporate Officer Brian has performed all duties in the best interests of the company. So Brian Underwood has never been sued or investigated by the SEC? Got it and thanks for clearing that up. To the best of my knowledge, nobody had ever suggested or implied that Brian Underwood had been investigated or sued by the SEC. We’ll leave Jenifer Grace’s peculiar press release about Brian Underwood and the SEC at that for now, and move onto efforts to establish the exact corporate executive structure and ownership of Rippln. As you can see, several other blogs have been set up in what appears to be a marketing attempt to pre-empt public background searches on Jim Bunch, Jonathan Budd and Brian Underwood in connection to Rippln. The fourth “Rippln” blog listed is used to republish information that appears on Rippln’s Facebook account. Why am I displaying a screenshot of Google’s search results above rather than the blog itself? Why did they do that? Well as it turns out not all co-founders are created equal, and that brings us to uncovering the exact geographical location of Rippln. Rippln, Inc., 901 Sam Rayburn Highway, Melissa, Texas 75070. I wasn’t able to clarify anything concrete on Direct Sales Software Inc, but as the name suggests this appears to be a software based corporation. Putting two and two together Direct Sales Software is most likely behind the “app” component of Rippln. Meanwhile Lacore Enterprises would appear to be the umbrella all of these corporations falls under. As the name suggests, Lacore Enterprises is of course owned by Terry Lacore (credited as “Officer” and “Director” by Corporation Wiki). So where does Rippln fit into all of this? When Tricia Stoesser, marketing director for the Stage Coach Theatre, sent me a note about a new app called Rippln, hers was the 20th question I’d received. The network marketing company Lacore Enterprises, in Melissa, Texas, raised questions as it launched under the auspices of changing the way we view social media marketing. On the company’s website, officials claim in YouTube videos that traditional social media built its reputation on the backs of the users and took the profits from that network to pay for expansion and growth – one video cites groups like Twitter, Facebook and Instagram. On another video, it claims games that extolled by networking reaped the profits. The promise, made in the videos, is that once established, Rippln will pass along marketing profits to the members. Lacore was founded in 2011 as an advertising agency and is a privately held company. Its attorney did not return calls. Why Rippln’s attorney, Jenifer Grace, didn’t return Hicken’s calls I have no idea but while we’re on the subject it’s worth noting that she might have a far more involved interest in Rippln beyond that of attorney. BehindMLM reader “Skeptic” reports that after purchasing an official record of formation from the Texas Secretary of State, he discovered that Jennifer Grace and Terry Lacore were both listed as sole directors of Rippln. CorporationWiki ties Jennifer Grace into “Grace Holdings LLC”, which indicates a possible financial stake in Rippln in addition to her role as their attorney (and Director). Grace Holdings LLC are listed as operating out of the same Melissa, Texas address as Rippln and the rest of Lacore’s companies. 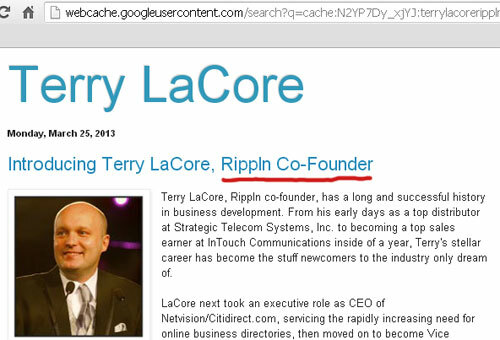 Now that we’ve established ownership of Rippln, the question arises as to why Rippln are not willing to disclose any of this publicly, and why they pulled from publication a blog they themselves had created advertising Terry Lacore’s involvement in the company. Terry LaCore, Rippln co-founder, has a long and successful history in business development. From his early days as a top distributor at Strategic Telecom Systems, Inc. to becoming a top sales earner at InTouch Communications inside of a year, Terry’s stellar career has become the stuff newcomers to the industry only dream of. LaCore next took an executive role as CEO of Netvision/Citidirect.com, servicing the rapidly increasing need for online business directories, then moved on to become Vice President of Sales at beauty products distributor Kaire, earning promotion to CEO in just a few short months. As a member of the executive team at publicly traded Natural Health Trends Corp. in 2000, Terry spearheaded a number of highly successful business development strategies including the creation of a health products distributor, Lexxus International. Rippln’s marketing spiel credits Lacore as having “spearheaded a number of highly successful business developement strategies” during his time at Natural Health Trends Corp.
Natural Health Trends Corp. (NASDAQ:BHIP), an international direct-selling and e-commerce company, announced today that the Securities and Exchange Commission has completed a previously disclosed investigation of the Company and others that was initiated in October 2006. The SEC’s staff notified the Company by letter dated September 12, 2008, that they do not intend to recommend any enforcement action against the Company. The investigation did result in a civil enforcment action by the SEC against two former officers of the Company, Mark Woodburn and Terry LaCore, who were charged with securities fraud and other violations arising from undisclosed related party transactions. Mr. Woodburn is a former president, director and chief financial officer of the Company, and Mr. LaCore is a former director of the Company and the former chief executive officer of NHT Global, Inc., a subsidiary of the Company. In late 2005, Mr. Woodburn and Mr. LaCore resigned as officers and directors, and the Company terminated their employment, in connection with an independent investigation by the Company’s Audit Committee. An SEC investigation and resulting civil enforcement action? Oh my… what was all that about? On September 3, 2008, the Commission filed a civil action in the United States District Court for the Northern District of Texas charging two former officers of Natural Health Trends Corp. (“NHT”) of Dallas, Texas, with securities fraud and other violations arising from undisclosed related party transactions from 2001 through 2005. The defendants are Mark D. Woodburn, of Southlake, Texas, NHT’s former president, director and CFO, and Terry LaCore, of Flower Mound, Texas, the former president of NHT’s chief subsidiary and an NHT director. According to the complaint, from 2001 through August 2005, NHT’s top distributor paid Woodburn and LaCore, directly and indirectly, approximately $2.5 million in undisclosed payments. The complaint also alleges that, in February 2004, Woodburn caused NHT to loan $256,200 to a Woodburn family-controlled company, and later took steps to conceal related party nature of the loan when it was discovered by NHT’s new accounting management in the fall of 2004. Woodburn and LaCore agreed to settle the SEC’s charges without admitting or denying the allegations of the complaint. A five year officer and director bar? Wait a second… 2008, 2009, 2010, 2011, 2012, 2013… but that’s exactly… oh dear. 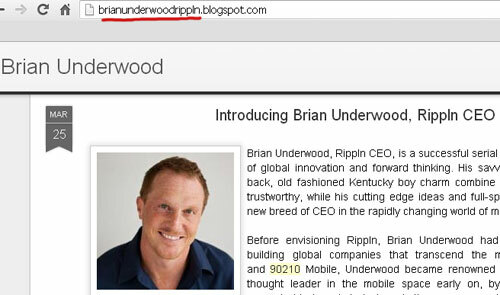 Rippln lawyer Jenifer Grace’s curious “Brian Underwood has never been investigated by the SEC” announcement suddenly makes sense. They weren’t trying to address the non-existent claims that Brian Underwood had been investigated by the SEC, using misdirection they were trying to pro-actively obfuscate the chances of anyone finding out Terry Lacore had. Natural Health Trends Corp.announced today that it had obtained a temporary injunction in its lawsuit against Terry LaCore, the Company’s former director and executive officer, and Mr. LaCore’s new company, bHIP Global, Inc.
As previously disclosed, the Company sued Mr. LaCore and bHIP Global, Inc. in 2008, charging them with numerous unlawful acts. The Court has found that there is credible evidence that the Company has established a probable right to relief on causes of action against Mr. LaCore and bHIP Global, Inc., including, among others, claims for misappropriation of confidential and proprietary information and unfair competition. (iii) Mr. LaCore entered into multiple contracts with the Company providing for the return of confidential and proprietary information. (b) obtaining confidential information belonging to the Company with knowledge that the information was obtained in breach of a confidentiality agreement between the Company and any former or existing employee, distributor or supplier of the Company. The temporary injunction also orders Mr. LaCore and bHIP Global, Inc. to return the Company’s confidential and proprietary information. How did the case end? NHTC dropped out by not paying their lawyers so the whole NHTC lawsuit was DISMISSED….Went down drain without a whimper! What happened there I have no idea but it was the only positive for Lacore I was able to find in relation to his involvement with NHTC. The SEC’s lawsuit and resulting civil enforcement action and fines speak for themselves and probably explain the secrecy and failure to openly disclose the entire corporate structure and ownership of Rippln. So where exactly are we at now? Rippln have launched what they referred to as a “stealth viral marketing” campaign, with the company openly declaring that ‘Rippln is all about recruiting new members‘ on the BlogSpot Rippln blog set up as part of their marketing efforts. Compensation plan wise it was revealed that the Rippln were going to pay $20 on the recruitment of 5 new free affiliates, and $80 and $240 on the recruitment of new paid Domestic and Global affiliates, with affiliates having to pay themselves if they wished to earn these commissions. Rippln has not fully completed its planning for the Rippln Rewards Program as it continues to undergo scrutiny by Rippln’s legal advisors. That of course wasn’t before Rippln told affiliates at a recent marketing event (according to a Rippln affiliate who claims to have been in attendance), that it would cost $300 to join as a Domestic affiliate and $900 as a Global. Between the SEC investigations, securities fraud, allegations of pillaging propriatary information and competitive secrets from previous opportunities and why Rippln are apparently actively seeking to distance themselves from revealing Terry Lacore is seemingly behind the business, the company has a lot to answer for. Unfortunately however, whether or not we’ll get an official response to any of the above information is not clear. 200,000 people have signed up for tickets to the Rippln MLM train, the drivers don’t appear to be certain on how to operate it and nobody really seems to know where they’re all headed. Between Terry Lacore’s history with the SEC, the (now retracted) recruitment driven compensation plan, 200,000+ affiliates who have signed up without really being told what they’re getting into and Rippln openly advertising the company as being ‘all about recruiting new members‘, I’d like to update that analogy by stating that in all likelihood the Rippln train seems headed straight into the laps of US regulators. Footnote: Full credit goes to the BehindMLM readers whose collaborative efforts made the basis of the above article. You can read the community discussion as it happened over at the BehindMLM Rippln Review. Not a train, Oz. A train is on fixed tracks. A “plane” or a “ship” that you don’t know pilot’s intentions is a better analogy. FYI, Bach Rx, linked to Terry LaCore, is a “pharmacy discount card” originally created by Mike Unclebach. Unclebach was terminated from Max International for affiliate poaching to join some other outfit called Regeneca. Regeneca has a big file on MLMWatchDog, having been REPEATEDLY slapped by FDA for false claims and “contaminated” products. This is just the most awesome investigation and insight.. these last three articles! 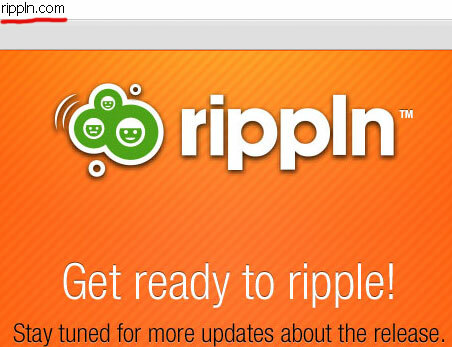 “Rippln” was ready to pull a fast one and snow everyone.. bet they didn’t know they’d be getting brickwalled here. It will be interesting to see how they scratch and claw to put the humpty dumpty scheme back together again.. It takes more that that to sneak the cheese by these rats! Affiliates have no idea where those tracks lead. Management do appear to though so the tracks do lead somewhere specific. Great read. I am so on the fence with this one. Budds response is interesting though. Have you seen Joel Comm’s review? He makes a good point at the end…but misses a point too. He says “what have I got to lose?” Well at this point not much. It’s free and all they are asking for is email and/or cell phone. But there is still one thing….reputation. I wonder if they might have had a better response from the non-MLM industry if they’d released the free app first…got everyone hooked on it…and tracked it via invites and then added the comp plan after? Terry LaCore & Brian Underwod make me wanna run. Jim Bunch is the only one that keeps me wondering what it might become. It’s interesting that one of the first to comment on Joel Comm’s website was “Kelly Williams”. I don’t know if this is the same Kelly Williams that joined TVI Express, then realized it’s a pyramid scheme, quit, and went on to clone it as “Club SeaBreeze. Any way, you are correct in this “what have I got to lose” attitude is dangerous. At best you get to share pennies and waste a ton of time. At worst you end up on some sucker list in some boiler room where you’ll get hounded by telemarketers pitching more get-rich-quick schemes to you. Wow, Thx for the research. I felt overwhelmed with all the rippln craze going on. Their launch system is really worth looking at and coul be re-used. But it just didn’t seem trustworthy. The fact that they require sign-ups just to give you access to the info videos totally pissed me off. That’s is where I felt they were tricking me. And that’s how they got free marketing without the person really being fully informed about the business. I think that is a fundamentally wrong approach to business. I thought Rippln weren’t taking payment from affiliates, what money are you referring to? Apparently only a few months ago Russel Brunson was a big shot in Pure Leverage. His name was linked to it all over the place, but you had to search for it. If you just search for Brunson you get his “DotComSecrets” instead. His SEO is pretty good. I felt overwhelmed with all the rippln craze going on. Their launch system is really worth looking at and coul be re-used. But it just didn’t seem trustworthy. The bigger the buzz, the more “hot air”. Wazzub was exactly the same way about 1 year ago, with the exact same excuses. They’re gonna share the revenue of search and social network (like Facebook and Google, but with money!) and you have to invite/refer people to make sure you get in because if you don’t have enough you won’t get anything! It’ll revolutionize the Internet! It’s free so you have nothing to lose! Wow, I’m glad I decided to do some research before wasting any time with this, a co-worker showed it to me and almost had me convinced to just jump head first into it. Thanks to everyone for all the great information. I’ll have to show this and the other articles to him and hopefully convince him to stop before he invests to much of his time, and eventually money. Complete and total Wazzub spin-off. Derail attempts are offtopic. If you want to challenge the facts in the article by all means do so, publishing baseless garbage however makes for little of interest. Leave that crap and all the “you are all ignorant” blind rahrah cheering on Facebook please. Unfortunately I already subscribed for Rippln, but I’m glad I came across this article. Too bad I can’t unsubscribe from Rippln. Anyone know how to do this or am I screwed? According to Chris Voss’s website (thechrisvossshow.com) You need to write to support@rippln.com and as them to delete your account. He investigated pretty hard and called Rippln a disaster in what NOT to do to create social Buzz (when TechCrunch brought up nearly the same points, there’s a little confusion on who said what). Thanks for the info K. Chang. This is the second time I’ve almost bought into a scam. MCA almost got me. Hilarious… Some copycats have released “Rippln” apps already on Google. There was one that already got deleted by Google, while the other one is “Rippln Team Elite Invites”, i.e. download it and you’ll get an invite. good thing i did not joined that rippln crap thing. other pyramid scheme deals. really annoying. It’s technically NOT a pyramid scheme yet, as they have accepted no money (that I know of). Their (retracted) business model was certainly pure pyramid scheme. I’ve seen Kevin Thompson’s name tied into Rippln which may or may not have been behind the compensation plan retraction. Apparently he was down at the Dallas event (unconfirmed). Although unconfirmed, it neatly explains the abrupt compensation plan retraction and current state of disarray the MLM side of Rippln appears to be in. They can’t release any further comp plan details (or a new revision) because they have to come up with a new one. It also explains why Jonathan Budd was on here asking me to give him a new comp plan and MLM business model. Oh please, I hope Kevin Thompson is not and will not be on retainer here. I mean between Grimes and Reese and Nehra and Waak playing dream team cover stories to the ponzie’s du jour what legal team does the legitimate MLM world have left to pretend cares more about the industry writ large than they do for the checks they can cash? Don’t get me wrong, I’m no babe in the woods and I know that the Bernie Madoffs of the world deserve the best legal council their victims money can pay for but that isn’t what I’m on about. There is a small circle of attorneys who sell their services on the notion that they know, understand, care for and hold some loyalty to legitimate Multilevel Marketing/Direct Selling. Yet when presented with the opportunity to represent some scammy little “they could have been legal if only they followed our advice but that doesn’t matter to us because their check cleared” type of deal, they pretend that it isn’t their fault that these scams rented their names to promote themselves with. KT, please understand that the dirtier a company is the cleaner they want their attorney/spokes person to be. But the more sleaze bucket biz opps you sell your name to, the less it will be worth. In this context, Frode says Howdy. Oz: t also explains why Jonathan Budd was on here asking me to give him a new comp plan and MLM business model. 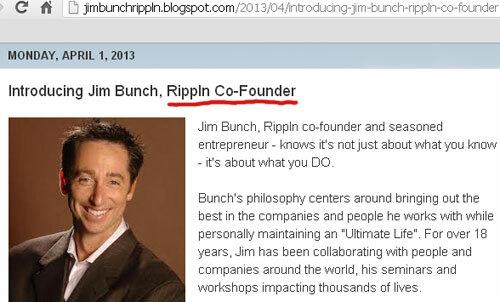 Don’t know who’s on retainer, but Rippln has its own counsel, the same one used by bHIP / Lacore: Jenifer Grace. Yeah Grace is a bit of a wildcard. Like I said though KT’s involvement is unconfirmed at this stage. Grace appears to have more of an ownership/investment role in the company from an admin perspective with legal compliance tacked on. She is after all officially registered as a Director of the company along with LaCore. Confirms the LaCore address in Melissa TX. No other relation with the LaCores that I find. She’s registered as director in several other business in the same building, as well as registered agent for several other businesses, according to Corporation Wiki. I’m not sure which was her maiden name. She was known as both Jenifer Balch and Jenifer Grace. The Balch profile says she’s married, and there’s a “Daniel J. Balch” and “Balch Automotive” in the same LaCore building. However, I can’t tell if that’s a brother or a husband. I’m going to guess maiden name Grace and married Balch, but I can’t tell for sure without another source. there’s a “Daniel J. Balch” and “Balch Automotive” in the same LaCore building. However, I can’t tell if that’s a brother or a husband. Jenifer Lynn Olin — married to Jeffrey J. Balch (1948-2007) on September 9th 1995 = Jenifer Lynn Olin Balch. But we’re not looking for missing persons here, or trying to identify the whole family tree of people involved. “Jenifer Grace”, “Jenifer Balch Grace” and “Jenifer Balch” are PROBABLY the same person. All of them will also match the middle parts “Lynn Olin” in some search results. I can’t believe it. I have just email amazon.com about this. Keep you posted about their response. I am joining RIPPLN because just in 4 weeks 500,000 USA are joing. I think 500,000 USA must NOT be WRONG hihihihi. Sounds bulletproof to me. Best of luck. have you ever heard about futuristic marketing? have you heard of the Reverse Funnel System or global resorts network? Well, Ripoff Report and other scam alert websites have all kinds of reports, complaints and scam alerts for them…. 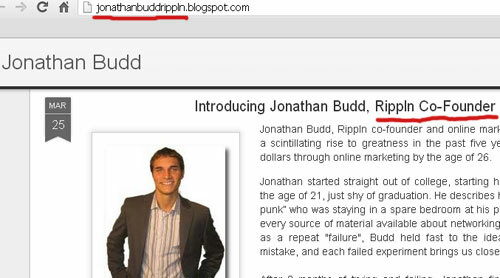 They all use the same scam techniques, including unauthorized charges to credit cards etc…all of which Jonathan Budd was involved in and in fact was the “pitch man” for, just like he is now for rippln. MY ADVICE IS DO NOT GIVE THEM YOUR CREDIT CARD INFORMATION , JUST CHECK RIPOFF REPORT AND SEE WHAT THEY DO WITH PEOPLE’S CREDIT CARDS. …(just watch and see what rippln will ask for after this pre-launch. Rest assured they will be asking for people’s credit card numbers for apps and other bogus purchases and charges, history is repeating itself) By the way all the new names that keep popping up with rippln, like mark hoverson etc… every one of them have ties to all the same scams…. These are the people behind and promoting rippln, which by the way has already been tried before under different names like tsunami project etc….they are doing what they have always done using different company names, after rippln there will be another…. They are very smart in how they hide the truth and flood the search engines with their own pages endorsing whatever scam/shell corporation they are promoting at the time… funny how jonathan budds page does NOT have all the products and services from all these other companies he pitches …. This is only the tip of the iceberg as there is so much more but all ANYONE needs to know it’s a scam are the reputations of all the people behind rippln (from brian underwood and the “burnlounge” scandal to terry lacore and the sec scandal). 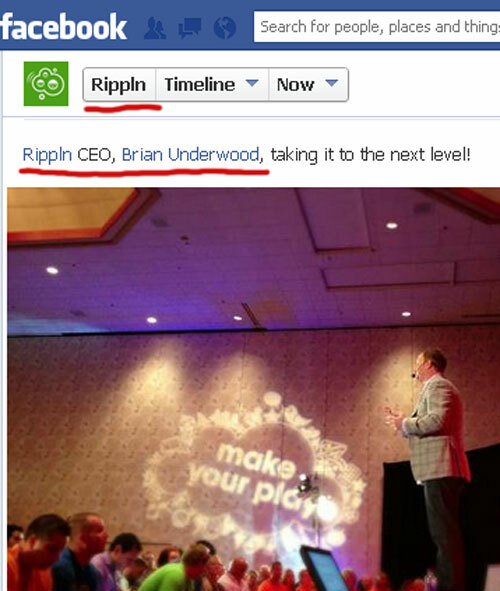 Every name behind rippln is a white collar criminal so watch out, because people are NOT players but rather getting PLAYED …. I found a new video of Brian. I think a CEO who pitches his own product (that’s not a CEO’s job) is slimy, and I think calling it an “interview” when it’s clearly promotional material is even slimier. My greatest sin is to trust people. Endeavored much to register the 2,500 people believing it would receive $ 20 for each 5 entries. I was more German investments $ 208 $ 2 websites created and finally invest $ 111 dollars to make power up to become a player, but the most serious is now if I want to have to get commission indusir people become players, ie we feeding a hungry bear and we only ripple promises. How do denounces them there in the U.S.. Because here in Brazil or office has registered with CNPJ. Even if this company is legitimate, it takes advantage of the current trend toward entitlement. As an entrepreneur who respects small businesses, I rejoice when someone makes it big. Rippin seems to attract those who want to leach off of another’s success. Yuck! Everything I have ever been told, ended up a being a LIE! I was a member months before the public were able to join by signing those “NDA” agreements. Such a load of crap/hype! I have many tens of thousands in my Ripple in every country. What does that equal financially? Nothing really…My commissions wouldn’t even cover my monthly fee and to this date, have not even cut even. All the initial players QUIT throughout my Ripple as they realized this entire company is nothing but a scheme. I have proof of leaders/founders cheating at the beginning, and when I asked for clarity or simple questions, I got pushed away, and labeled as being “negative”, the typical MLMer responses when challenged with hard questions. The guys on top are really, really, really bad people, and I TRULY believe that. They DO NOT have the members best interest as a priority, but, only how are they going to make their last bit of sales off the remaining suckers who believe in their “vision”. I WONdEr if Jennifer balch or Jennifer grace will be representing Brian underwood for his upcoming elderly man assault case in Kentucky? Makes one wonder!!! Wonder…Woman, can you tell me more please??? BU assaulted an 80 year old man. Daviess County (owensboro) KEntucky. It will soon go to trial and the truth will be revealed. He puts on a real good show. Brian S. Underwood (founder Of Pruvit, izigg, ripplin, etc) is on a two year probation for the assault of an 80 year old man. Check the facts in Daviess County court house. In Kentucky.